In terms of core HR management, there are hardly two companies that share the same expectations for such a solution. Each company’s HR requirements usually vary depending on the size, industry, and location, which obviously affects their HR software usage. As each company grows in size (and management complexity) managers struggle to round up internal knowledge and to decide which set of features suits them best. Luckily, developers understand the need of keeping tabs on every employee-related issue, and they base their work on the expected productivity at the end of a manager’s working day. One observation, however, remains true for every company: companies are fed up with combining multiple systems, and they are ready to consolidate. The driving force of their pursuit for the perfect HR software is compelling experience, delivered as a suite of valuable features for both talent management and social engagement. The best news is that these systems are only becoming better and better. Meanwhile, choice became so overwhelming that HR staff is often forced to look for a needle in the haystack to decide which system is best. 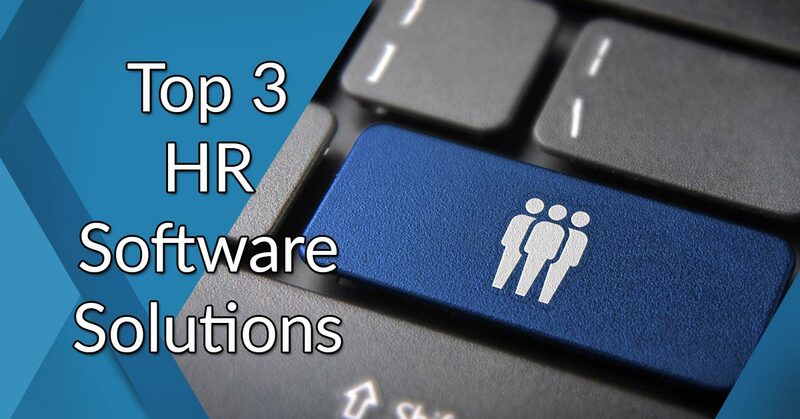 To help you with that problem our team of experts analyzed all the best HR management software services available on the market and we chose three systems we think are best. The analysis was based on key features, specific capabilities, vendor experience, and progressive trends. We’re convinced that among these software solutions you will be able to find one that can fit the scope and expectations of your business. BambooHR is the frontrunner of our top HR products list with an impressive rating. Our team found BambooHR to be the most flexible, inexpensive, and feature-rich software for small and medium companies. Designed to serve human capital management in cloud, BambooHR looks and performs impeccably, and provides users with an automated applicant tracking system which governs the entire employee lifecycle. Our BambooHR reviews shows that the best thing about this app is its modern and well-organized feature suite which provides visibility of critical indicators including turnover and retention rates. Among other features, the app delivers advanced personnel data modules, stripped-down performance monitoring, and handy reporting for growing businesses that wish to retain top performers. To make matters even better, BambooHR integrates with more than 20 business systems and applications for painless data import/export. The quote based pricing scheme is a possible benefit as well, because your company can count on a tailored pricing plan corresponding to your specific needs and budget. Before you’ve made a final decision, we advise you to try out their features with a free trial that is available. You can easily sign up for BambooHR free trial here. But how exactly did BambooHR surpass its close competitors, who often had a longer market history? Our BambooHR reviews answers this question. With BambooHR, recruiting becomes an extremely easy task. The user can manage job openings, review and rate applications on the same dashboard, from where he will also add vacancies and insert all information related to them. All filters are displayed in a dropdown menu, together with an intuitive text editor for longer descriptions. Once prepared, the vacancy can be posted directly to all social networks and popular job boards. Once selected, the new employee receives a special email containing all necessary training information, as well as full access to files and documents relevant to their position. From the first moment they log into the system, they are enabled to edit their personal information, and participate in all important discussions. The entire administrative power of this system is collated in the Employees section, where the manager plans projects, assigns tasks, and adds benefits and time-off balances. Unlike traditional HR managers, where performance is analyzed per year, BambooHR compares individual activities to common goals on a daily basis, and uses a quadrant-style matrix plot to compare employees, and select the best ones among them. Benefits, on the other hand, are listed in the centralized database from where the manager can track them in no time. There are 12 benefits overall, that can be applied to individuals or groups depending on their status. One thing that must be mentioned in this regard is the modifiable rate health plan, thanks to which managers can track things like age-based plans, and calculate the variable amounts their employees have to pay. BambooHR gathers all important data under the same hat, consolidating both business documents and employee records and allowing them to be reviewed and retrieved for a particular action. Once all data is there, it can be exported and applied for the automatic generation of accurate reports. Working with BambooHR will lead you effortlessly to the best and most talented candidates, and will track their records until you decide to award them with a position. The best part is probably that employees are ‘present’ while this is happening, being notified about important tasks and allowed to collaborate for the better accomplishment of those tasks. Zoho People is another well-known product from the HR category, which isn’t really that far from BambooHR in terms of features and benefits. 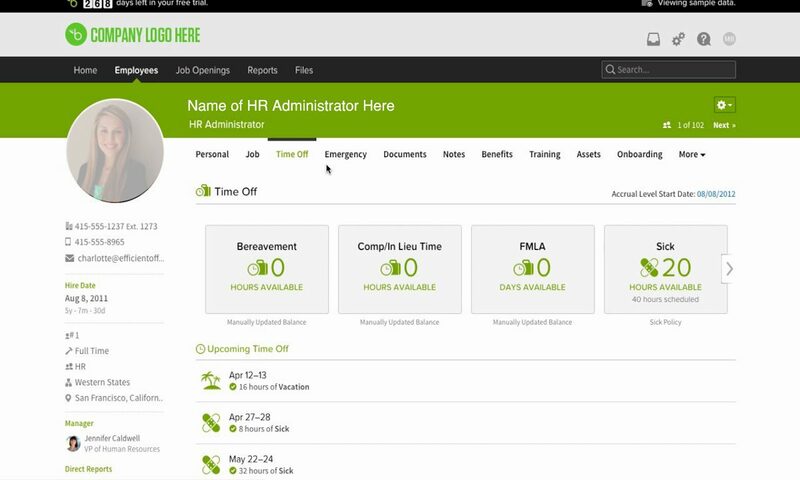 It is just as intuitive and easy to use, and combines most traditional HR management functions in a user-friendly dashboard. Just like BambooHR, all features in Zoho People can be tested using a free trial, but it has a pre-defined pricing scheme with several options offered to SMBs and enterprises. The most notable disadvantage of this system compared to BambooHR is it offers only basic reporting features. Just as in the case of BambooHR, power of this tool is concentrated in the Employee Portal, a centralized database managing all employee information (training records, specific achievements, leave applications, and much more). As far as users are concerned, Zoho People is definitely a shortcut towards reduction of cost and improving time ineffectiveness of your company. What Zoho People is best known for is its time off management feature, which allows you to track time with simplified spreadsheets and automate attendance processing. This can be a handy feature for large and decentralized teams looking to consolidate the attendance and leave the details to each employee, including even casual leaves which are instantly approved within the same system. Once gathered, all information is stored in the database, and available for further use. Zoho People goes beyond traditional employee management, allowing for data centralization, automatic updates, open employee access, and a self-service portal all in one. It simplifies time operations, as it has a separate section for managing and monitoring attendance, abseces, leaves, and rendered time. Hiring authorities benefit from attracting and rewarding talented workers, and making sure they undergo a seamless on-boarding process to make the most of their potential. The last contender on our list is Workday. This software appeared on the market earlier than similar HR programs, which certainly gives it a reputation fore credibility. It was a pioneer of innovative HCM solutions, and so far we found only BambooHR and Zoho People were able to surpass it over the years. Still, we are pretty confident that Workday will remain on the market for many years to come, because we’ve seen its spotless capacity to respond to challenges and to navigate economic change. Similarly to previous tools, Workday allows you to run the business your way, because it comes with easy and progressive customization to help you stay on top of your monthly expenses. It is a powerful SaaS solution for large and complex businesses that manages human capital, revenue, and finances in a progressive fashion. In contrast to BambooHR or Zoho People, this program doesn’t exclusively specialize in HR management (this can be an advantage though). Workday is a cloud-native, customer-centered program that puts talent above anything else. Rather than taking over your decisions, Workday prioritizes and guides your work without any installation or maintenance efforts on your side. At the same time its multi-tenancy model allows users to tackle solutions individually, rather than sharing work with the entire community. It is well-integrated to function seamlessly in your IT world, even if you are the only one in charge of customizing your workspace. Being as reliable and rock-solid as it is, Workday is still an intuitive way to run your business. You will have a real-time overview of the progress available with a single click, and a detailed database available everywhere, at any time. Once you put data inside, there is basically nothing you need to worry-about: Workday has great security procedures, and it can protect its integrity against any serious breach. Another reason why this software can be useful to your company is its excellent performance in terms of financial capabilities, progress tracking, and fully auditable process management. What to expect from top-notch HR systems? Compliance with varying requirements. If you’re running a business that needs to keep pace with reporting regulations, you should appreciate compliance-ready systems that update automatically upon regulation modifications. Flawless integration with standard systems. Most companies are looking to improve their existing HR systems, rather than to replace them completely with new ones (that makes perfect sense after you’ve invested years in customization codes and employee-friendlier interfaces). Great cloud-hosted HR software is expected to include a set of standard APIs that enable seamless data transfer from any old system you’ve been using. Handling core HR functions. This is the aspect that pushes the best ahead from the rest, and it goes as far as to replace staff for performance of core HR activities: hiring, outsourcing payrolls, deposits and taxes, reviewing and rewarding performance. This matters especially to small companies, where HR matters are frequently left to line managers with no HR experience because they cannot afford large teams and a traditional 24/7 service. Unlimited HR visibility. Is there a company that doesn’t want a full-picture of its human capital performance? Technically speaking, the software needs to use advanced HR analytics in order to access turnover trends, to predict and determine accomplishment levels, and to follow deadlines and recruitment productivity. Unconditional customization. Streamlined work processes and employee schedules are just a brief generalization of one company’s needs. HR departments aspire for systems that can be adjusted to their specifications, be it contract or hybrid employment, industry-vertical or specific reporting tools. The rationale is to reduce costs and operation waste, and to save as much time as possible. 15 Popular HR Management Software Solutions: Which One Is The Best?